On-Page SEO: 12 Important SEO Tips - Technical Mahaur - Learn Something New Everyday in Hindi! If you are getting this article then I think that you will be a blogger and your site will be concerned about how to fix SEO. Do not be scared because today we are writing these posts to get more information on SEO's 12 important tips. By reading the whole, you will get the sense of where you are going, and what you should do so that you can make your blog even better. What will your site be up to or about? What is the main purpose of creating this? Do you really want to make it? Once you know the answers to all these questions, you should start working on your blog. 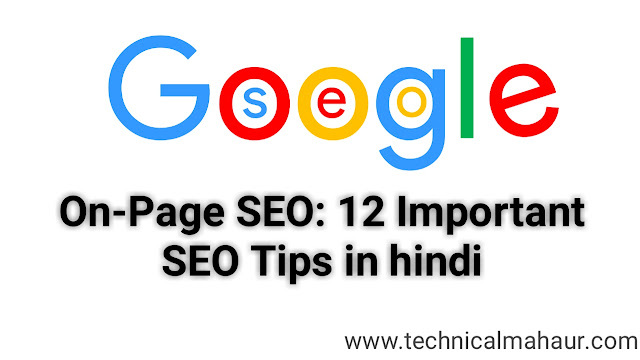 So let's start without delay and know what the 12 important tips for SEO are and how we use them on our blog. If you really want to fix your blog's SEO then you should know about these 12 SEO tips. Then start again. 1. Think of making your blog in the same NICHE. You should think about building your blog in a single category or niche. With this, you can do better research and search engines will also feel that because you are writing articles on the same type of topics, they will start to understand you as a subject's expert and show your articles in google's top search results. They do not say that if you hurt frequently in one place, then they will be broken once or not. In the same way, if you write about the same topic, then any article will be ranked again by which you can also post another article. 2. Select the right KEYWORDS and make sure MENTION in the right place. You always spend more time in keyword research. You can use many free and paid tools for this. These keywords should be used in places like your site title, domain name, description, tagline, keywords, blog categories, page titles, and page content. That's because these are keywords that can be searched by users in your search engine. If you use these keywords correctly and in the right places, then it is good for SEO of your website. 3. Use INTERNAL LINKING in your SITE. All these bloggers are aware of the importance of internal linking for SEO. But still do not use this great seo strategy in your blog. You should always think that interlinking is not only suitable for seo but it also facilitates visitors to navigate in your site. For this, you can link in category wise, and you can include important links in your home page. 4. Use the PERMALINK STRUCTURE that contains KEYWORDS. In any blog if the permalink structure is not correct then this is not right for its SEO. Looks like this does not look right too. So doing this can prove to be very dangerous for any blogger. Instead, you should use a URL structure that should contain text only, try to use keywords in it. 5. Anything that slows down your WEBSITE should be REMOVE. Any plugin, music player, big images, flash graphics or any element that is reducing the speed of your blog should be removed or alternate in its place. 6. Use your KEYWORDs in your IMAGES. Keywords should be used not only in your article, but also in the topic of the site, in image title, in description, and alt attributes. For this, you should re-title the file name so that you can reflect on your main keywords (eg er4343.jpg instead of seo-tips.jpg). 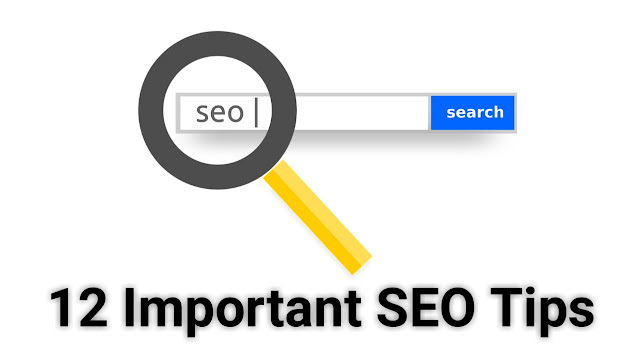 It is very important from the eyes of SEO. 7. LINK with other WEBSITES who have RELEVANT CONTENT. To do this, you can include a blogroll, link list, or resources page in your webite. If you have written a good article and you have seen the same type of article as another blogger then you have to talk to them to link exchange with each other. For this you will have to find other blogs like your blog and link them with your articles. 8. Continuously UPDATE your SITE. The main difference is that in the website and blog, where there are static content in the website, there are dynamic content in the blogs. Search engines like Google always need fresh articles. They give more preference to such blogs. Therefore, directories like Wikipedia and blogs perform so well in the search engine. Because they always keep updating their writers who provide more value to the people. 9. INDEXED your WEBSITE in SEARCH ENGINES. Many search engines index your content by searching your content automatically, but do not rely on it too much. You must always check that all of your articles are crawled by sending search engines such as Google, Bing, and Yahoo by sending your crawling bots. If they do not, then you have to manually indexed them. 10. Always try to find out how other WEBSITES can link to you. This is a very important thing for SEO because if you link to other websites or blogs then your google rank will automatically increase. This will increase the authority of your website. So spend as much time as possible on the link building. You can use guest post or chat with other competitors blog and tell them about your great content. With each other, you can build this link. I have seen that many bloggers keep changing their blog name (domain name) in Beach Beach. It is not okay to do this because the age of the URL for site ranking is also a very important factor. So you have to be patient and do not want to change the URL of your blog by visiting someone else's misbehavior. With this you should work in the same blog, and not to create a new site repeatedly. This will give you an opportunity to work more and you can work well. All the tips given above will not work if you do not have human touch in your content. It means that if you write any good post, people will not enjoy reading it, then they will not like to read it as they will feel that it has been written with the help of any software. It does not show any hard work of the blogger like you. Often people do not like Robotic text, so you should pay particular attention to this. I believe that if you follow all the tips mentioned correctly, then you will get success in blogging. But for this you need to pay particular attention to two things that are Patience and Consistency. You will not succeed in a day or a month. For that you have to work continuously with patience and write good posts like this. Believe it, you must be successful. I am able to say this because I myself have used these tips in my blog and you know the result that how Hindime.net is performing well in its category. Often people ask what is SEO? So let me tell you that the complete form of SEO is Search engine optimization (SEO). This is a type of practice in which the bloggers write their content in such a way that their articles are easily ranked in the search engines and organic traffic starts coming to the blog. But both the quality and quantity of articles should be correct. All games have traffic and this is why SEO is an important contributor. 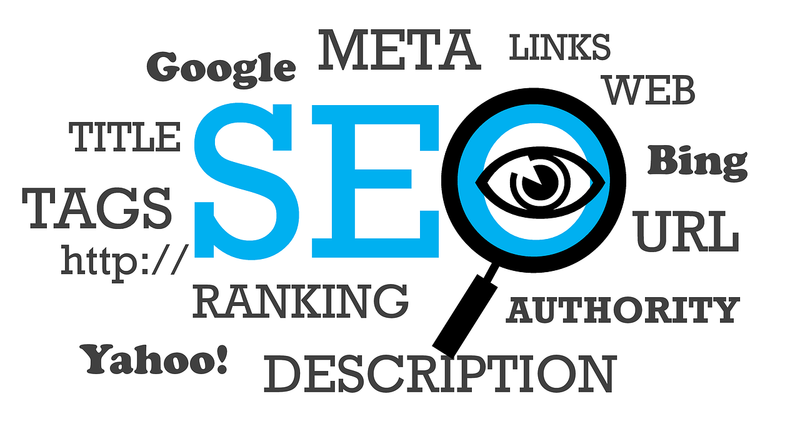 So let's know about some of the key SEO tips. Blogging is a destination not Milestone For this you have to do something every day. Your blog has to do better than ever. This whole process is like a journey where you do not lose hope and have to work continuously. And always have to give the highest importance to our readers. Because your blog is for them and if they are not happy then there is no reason for your hard work. Hope you have 12 Essential Tips for this article SEO? How did you feel like writing a comment, so that we too can get a chance to learn something from your thoughts and improve something. In order to show your happiness and excitement towards my post, please share this post on Social Networks such as Facebook, Google+ and Twitter..
SEO SERVICE Thanks for the tips guys. They were all great. I have been having issues with being fat both mentally and physically. Thanks to you guys i have been showing improvements. Do post more.